I can’t really believe I haven’t posted this one before. I’ve been making it for years, and it is a favourite for many people. The recipe comes from the Rebar Cookbook, which was put out by a great little vegetarian restaurant in Victoria, BC. 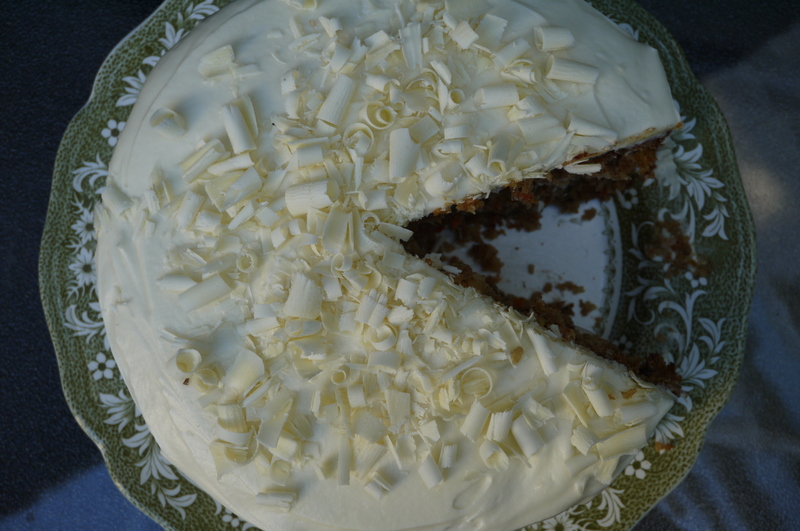 There is a bit of work involved in this cake, but just chopping and grating a few things, nothing too technical. It also makes nice cupcakes or a 9 x 13 cake. Butter and flour two 8″ round cake pans. I like to cut out circles of parchment paper to fit into the bottom of the pans for easy removal. Preheat the oven to 350F. Combine the grated carrot, pineapple, coconut and chopped walnuts in a large bowl. In a mixing bowl beat the sugars with the eggs. Add the vanilla and beat on high-speed until the volume has tripled. With the beater on low-speed, pour the oil in slowly to blend it in. Combine the remaining dry ingredients and gently stir them into the egg mixture. Fold in the carrot mixture. Divide the batter among the cake pans and smooth the tops. Bake for 30 minutes, or until an inserted toothpick comes out clean. Let the cakes sit in the pan for about 10 minutes, then run a knife around the edge and invert onto cooling racks. After the cakes have cooled, prepare the icing. Begin by melting the white chocolate in a double boiler over medium heat and set aside to cool a little while you do the next part. Beat the room temperature cream cheese on high-speed until smooth and fluffy, then blend in the vanilla and butter. Add the melted chocolate to the cream cheese mixture and mix on high until smooth and fluffy (I added the chocolate when it was too warm, and I couldn’t get to the fluffy stage. I put it in the fridge for 10 minutes and that solved the problem). Slowly add the icing sugar, stopping to scrape down the sides now and then. Beat on high until the icing is light and fluffy; about 3 minutes. Spread the bottom layer of the cake with one-third of the icing, smoothing it evenly to the edges. Chill for 10 minutes. Place the top cake layer on and frost the top and sides. 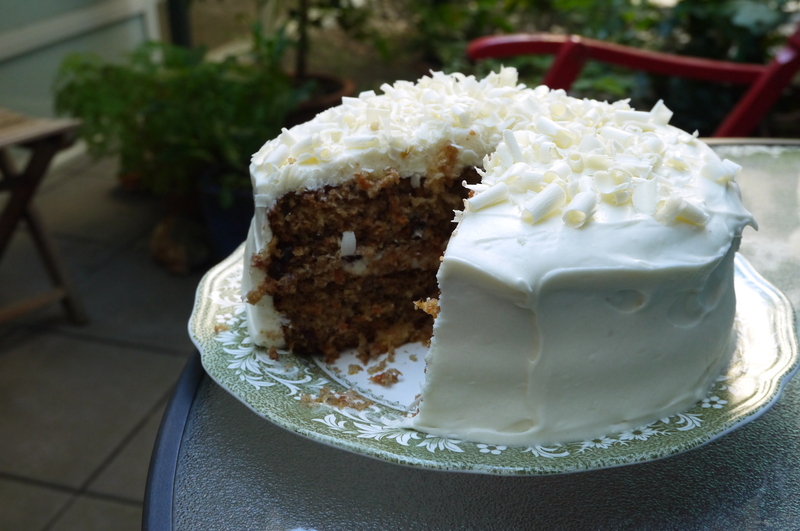 I garnished it with white chocolate curls, but my next choice was to make a border of chopped walnuts around the edge. Toasted coconut or a decorative piped border are other options. Store refrigerated where it will keep for up to 4 days.